I frequently receive calls from acquaintances and acquaintances of my acquaintances. The problems concern taxes and customs. My student friends from my time at university are happily married, have not declared in the tax return as an asset the holiday house they own in Portugal and are afraid that it will be discovered and they will be fined. The colleague of my colleague, who receives a disability pension, has received a small rental income from the apartment, which she inherited from her father in France, but never declared in Switzerland. The neighbour wants to sell a picture by a well known Swiss painter, which she received from her grandmother many years ago, and is afraid that the Tax Administration will notice it, because she has also never declared it in her assets. The daughter of my colleague has bought some clothes in Milan, recovered the Italian VAT, but never declared the goods in Switzerland. Now the Swiss customs have announced they will visit her. She wants to know what to do. Recently stories about cars have become common. One drives to the garage in Germany, has the car repaired, the wheels refined, the carrying rack fitted or has the tyres and hub-caps changed. At the border one wonders why in the worst case there is an additional payment in Germany and in Switzerland and then calls me up to discuss whether one could contest the penalties later. Often there is nothing I can do but say that the penalty could have been even higher and that in fact you were lucky. What do I have to do, if I undertake value enhancing measures in Germany on vehicles registered in Switzerland? When entering Germany, you have to register in writing in individual proceedings the “Verfahren der aktiven Veredelung” (Inward Processing Regime) at the German customs office with a single administrative document and deposit a security in cash. The amount of the security depends on the value of the vehicle. The German customs official makes the estimate. On top of this is the VAT, provided you are not entitled to input tax deduction in Germany. If after completion of the processing the vehicle is re-exported, the security deposit is refunded. Of course, on returning to Switzerland, when crossing the border, you have to make a declaration at the Swiss customs post based on the workshop invoice and, if the amount exceeds CHF 300, pay the Swiss VAT of currently 7.7%. If you don’t do as described above and are caught, not only the vehicle owner is penalised but also the garage. In the end it costs much more than the 7.7% on the garage invoice. But I have also not been spared mishaps at the border. 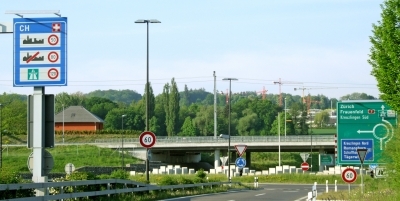 Once when returning from the Czech Republic, we were stopped at the border. I was very relaxed, because I knew that we had nothing which could cause concern. I opened the boot and the customs officer looked in. When he asked me what was in this box, I only swallowed hard. I had never seen this box before. I had no idea. I asked my 2 elder daughters what was in the box. At the time both were under 18. They replied in complete innocence – “beer for our school friends”. The customs official opened the box and 12 bottles appeared. I was wild. Why hadn’t my daughters told me? The customs official looked at me, saw the colour of my face change and how I was about to blow up. He asked my daughters: “It’s alcohol-free beer, isn’t it?” And my daughters answered very loud and honestly: “No, no, that is the strongest beer we could find.” What followed was a prosecution that cost us ages and a charge of less than CHF 3. I was furious with my two daughters as I had seldom been before. That proves that knowledge as such does not protect from mishaps. Categories: My Blog | Tags: customs, Customs duty, Germany, Tuning, VAT, Vehicles | Permalink.